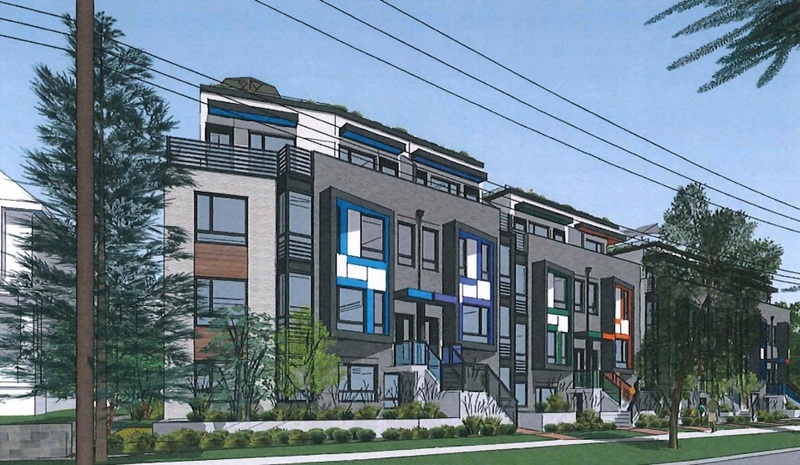 Three single-family dwellings at the northwest corner of the intersection of West 63rd Avenue and Columbia Street in South Vancouver could be replaced by two four-storey stacked townhouse buildings with a combined 27 new homes. 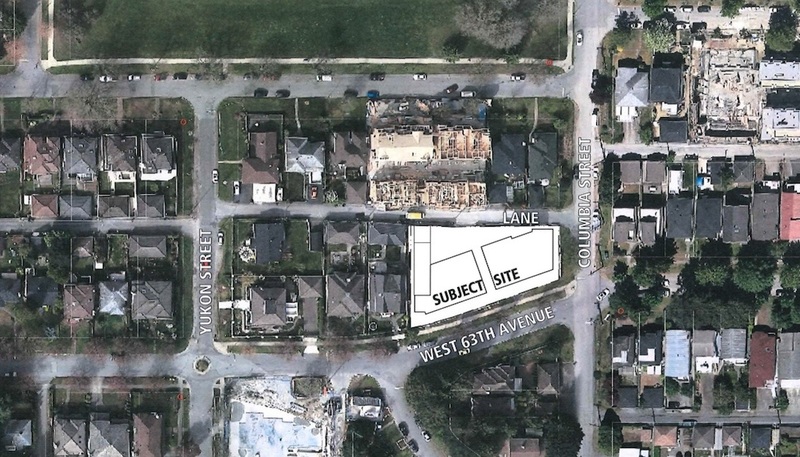 A development application has been submitted by Fougere Architecture to redevelop the site at 333 West 63rd Avenue — located about two blocks north of Marine Gateway. Ground floor units will mostly have one or two-bedroom suites, making them more affordable for first-time buyers, while three-storey back-to-back townhouses will be above. Each townhouse will have three bedrooms, in-suite storage, and a private rooftop patio. The unit sizes will range between 481 sq. ft. to 1,900 sq. ft. 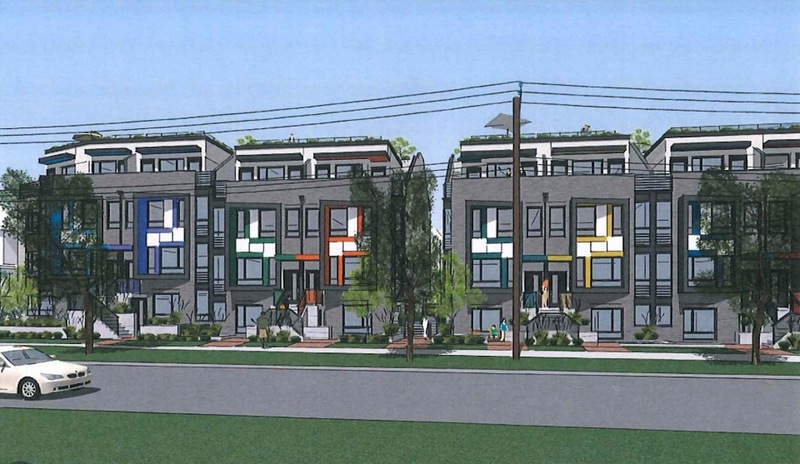 Both buildings will have an architectural style that is meant to be a “modern interpretation of classic row houses.” Exterior brick materials will be accented by colourful window frames. “The coloured insides expresses the individuality of each unit while the angled frame creates shading from the western sun and, at the same time, make the colours a very visible element from the corner of West 63rd and Columbia,” reads the design rationale. Parking will be provided in a single underground level accessed from the laneway. Overall, the total floor area spans about 32,600 sq. ft., providing the proposal with a floor space ratio density of 1.88 times the size of its lot. 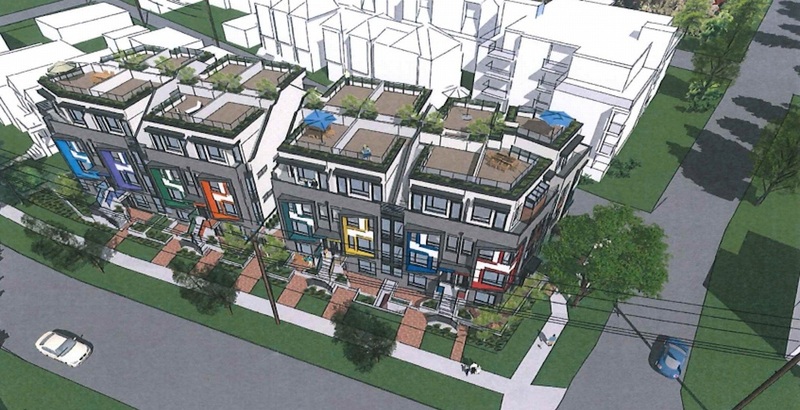 While the neighbourhood is currently predominantly single-family residential, the municipal government’s Cambie Corridor Plan calls for additional density of up to four storeys on this particular site. 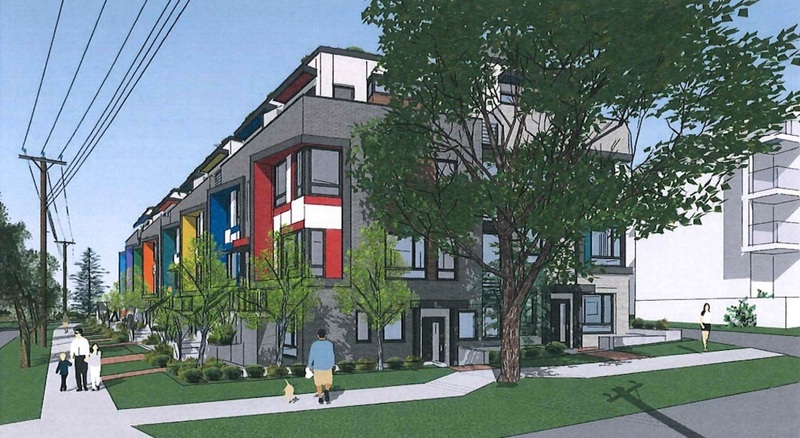 A four-storey townhouse development is also being built immediately north of the site, and two more single-family dwellings adjacent to the property will be demolished and replaced by a four-storey apartment building.